February | 2015 | Whose Education Is It Anyway? This weekend has brought a few reminders for L&D (well, actually, any web-powered service provider) from difficult experiences for two of the biggest players – Amazon and the BBC. If your service isn’t working, communicate. Amazon UK and, apparently, Germany have been down at times today. At the same time, irrelevant tweets have been posted by Amazon UK – rather than anything explaining the problem. If you own a webpage I’d say you really need to support it via Twitter, if you are a global company that should really be 24/7 support. Integrated systems are not always best. I noticed the Amazon UK problems from Prime Video not being accessible on my PS3 – that a failure can impact video, retail site and phone users is pretty terrible service. This raises some interesting questions for L&D about putting all your content through one interface or taking a safer approach of spreading the risk between, say, LMS, video, assessment and communication apps. Don’t go for a big push if you’re not sure the system can handle it. Obviously, for Amazon to be down in major European markets, there has been some kind of catastrophe failure/attack. However, you have to wonder how much of an impact Amazon’s recent pushing of Prime Video has had, for example, I accidentally opted in to a month trial when buying DVDs recently. For the rest of us, it reminds us how gradual roll outs can often be a better move than ‘big and loud’. Get the users involved. The new BBC mobile homepage has predictably led to a lot of negative comments. Whilst you can never please everyone, it does feel a little like trying to surface click-bait BBC content rather than helping surface top content and navigate to key areas. Scroll of death. An issue that has cropped up with many LMS systems over the years – the new homepage seems to encourage scrolling over more intelligent navigation. Just For Me. A lack of personalization/customization seems to encourage bookmarking of your personal interest topics rather than coming through home. Images at your peril. Especially on mobile, space and time are precious – the forcing of images (especially when they often do not add anything to a piece of content) is just not helpful in my eyes. Sure, if the image has a purpose then use one (for example, the car camera of the Taiwan Plane) but don’t use templates that add images just for the sake of it. snow, snow, snow – closing schools across parts of the US, Canada and UK – reinforcing the value in online delivery and electronic ‘home work’ to avoid snow days. OpenLearning expanding their MOOC offerings through $1.7m investment – implications for Instructional Design market and other MOOCers. …and online training/content providers – $36m for Code School?!? ..while Instructure is busy getting money together pre IPO. 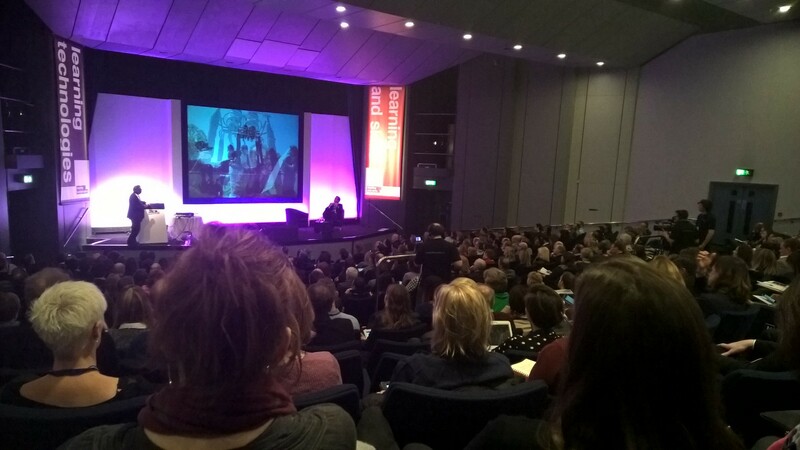 #LT15UK was my first Learning Technologies winter conference, rather than the summer forum or winter exhibition. I’ve always avoided the conference due to the cost but it was really useful to spend a couple of days thinking, high level, about the nature of workplace learning. Even a few days after the conference, I am still contemplating what was discussed and trying to draw my conclusions. To a large extent it has reaffirmed my belief that most learning professionals are failing their audience (school, higher education, workplace). However, whilst I would be keen to rip up the existing models (see my virtual school post as an example) the pragmatist in me was looking for ways forward in the shorter term. By attending the conference, rather than the exhibition, it was such shorter term trends I struggled to pick up on. Messages from the conference, for me, were more around how learning needs to be overhauled to recognize new ways of working and changes to the key attribute it has always existed for – empowerment. I would argue that, by thinking of learning as empowerment, we can better think about learning if we put it in the terms of productivity and engagement in the workplace. Of course this is very much thinking about things from my perspective (including educational informatics) and I’m deliberately putting these notes together before reviewing the event’s back-channel in any real depth. Additional posts might be forthcoming based on that review. A brave new world: how the cloud is revolutionising our learning, Professor Sugata Mitra. An update on Mitra’s projects since the last time I heard him speak (the main development since then being his new style schools are up and running). I totally agree with him that for a lot of learning the learner, with access to the Internet, can lead the learning (and that a facilitator can provide positive reinforcement and support). I would challenge him over how to ensure motivation to learn exists and also that people can be trusted with the technology. Whilst I love his presentation style as something of a utopian, alas we have probably all worked somewhere where learning tech kit has gone walkies. To an extent, the self organized learning environment (SOLE) of his model is parallel, in my mind, to the ideas of a full ‘learning organization’. Specifically, like traditional teachers adopting SOLEs, L&D teams need to realize they can not manage learning but can support it to be as efficient as possible. Mitra talked considerably about dematerialization. I would agree that learning as a process may dematerialize one day due to a download, implant or upgrade to the human body but for now lets focus on facilitating it as best as possible via making learners acknowledge it is for them and they should be in control. An attempt to “recalibrate” the future of systems and LMS conversations to today. The argument was that, ultimately, admin and compliance have led to the main use cases for an LMS. In this model there can be huge value to a business, especially if legal compliance is a requirement to operate, but the value is not for the learner. As the presentation put it “the LMS is not the center of the business, work is”, hence it is not the most important internal system. Personally, I see this as about the nature of work, can work be done in the LMS? If not, can the LMS present learning at the appropriate point of the workflow? If we are simply using an LMS for compliance then do that and be honest about it. Let’s not pretend that we are tracking all corporate learning in an LMS, as 70/20/10 reaffirms, that’s not the case. The presentation focused on the importance of innovation and I liked the two circles of functionality that LMS elements can be compartmentalized within: “operational performance” and wider cycle “optimized future readiness”. The argument was that an LMS is still needed but needs to do better at fulfilling these circles. Having completed an MSc that specifically called out ‘instructional design’ as a key component (the only course I could find that did in the UK at the time) this session was of interest to me! Whilst Mitra might argue for facilitation and the need to create curriculum from questions to fuel learner self direction, Shank argued that ID needs to focus on performance issues and improvement (the two positions obviously not being mutually exclusive). The conclusion was that IDs have a lot of the skills to deal with performance improvement in the ever increasingly complex workplace and the Instructional Design Competencies model helps as a framework. I think most people would agree that scenarios can help get a message across, especially in training. This session really just showed some key steps to ensure scenarios are too boring. Firstly, use scenarios when you’ve determined there is a learning need that requires judgment not binary choices. I liked a point made that we should learn more from related fields. Interactive fiction was mentioned as an area where IDs can take ideas from, such as links to optional back stories to increase mystery and empathy. Tips for question options – get common mistakes out of the SME before the correct answer, helps build out the conversation. Don’t jump straight to correct responses. Feedback best practice – keep the story going, intrinsic not instructive feedback as dialogue. Information needed to answer question – don’t present as slides, instead focus on what need to know – other bits can go into job aids, etc. Overall, I thought the presentation had a lot of very sensible stuff in it and the little checklists above are useful reminders to consider going forward. This felt a little rambling but, as you would expect from Winston, there were some hugely informative points and a lot to think about. There were some commonalities in the presentation to others I have seen, for example, he argued the most important technology has been the hand axe (akin to Donald Clark’s reminders that technologies have continually impacted on mankind) and the importance for L&D to consider neuroscience (as at BETT 2014 where Baroness Greenfield presented). The key points with regards to learning included that, whilst learning can be difficult at first, we know that reinforcement and practice will bring results. Indeed our environment, not our genes, impacts our exposure and ability to learn. There were also mentions for some of the aspects that explain how we behave, for example I know I often unconsciously pickup phrases and actions from others – this is based on learning from others (so if we want people to learn values and correct behaviors we need to embody the values we expect people to develop). 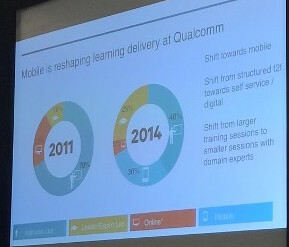 Information on Qualcomm’s use of mobile, including for learning (http://www.worklearnmobile.org/). I really liked their approach – have an app store portal to aggregate what is available (including apps they have built and ones available to the company – such as the FT and Harvard Manage Mentor). 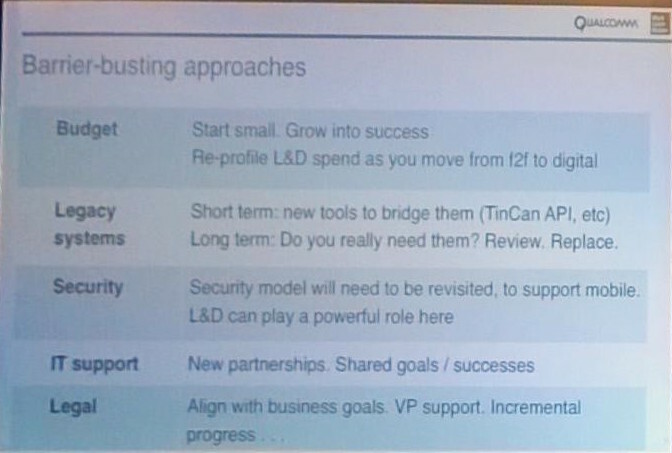 Whilst I would normally presume ‘learning’ would be one app (usually delivered through an LMS app) this may well be a more sensible approach – acknowledging that a big company will have multiple apps and that it is easier to deploy them individually via a portal (as Geoff said, the toolbox approach can scale better than the army knife). Their vision for learning is “almost like a library” and this is obviously akin to my own background and belief in learning. A number of apps were shown, including video and games based. The one that jumped out at me was Pathgather. It sounds like this tool allows for crowd sourced learning paths – this sounds outstanding as allowing for L&D to create recommendations of learning journeys but also allowing subject experts to recommend things based on their experiences. If we want to empower people to learn as part of a learning organization then such tools are an excellent idea, no one knows everything anymore and socially sharing and collaborating around work (and learning is work) is key. They are working with other organizations on ensuring SSO and other technologies are in place to ensure the system works the best it can for an organization. They also tend to do web app first which I like as I’m still sure we do not need to build native applications for everything. The presenter’s team is 50% mobile app developers – that is a really interesting one for everyone in learning I think in changing what we mean by learning (technology) professionals. Mindfulness has been a hot topic for a while with David Gelles, of the New York Times, having brought a lot of attention to it. It centers of giving people meditation time at work to improve well-being and performance. This is often coupled with eating regimes and exercise, such as yoga. Whilst I would not argue with his facts and figures, the evidence of improvement, from such schemes I would, however, say there are some underlying elements. 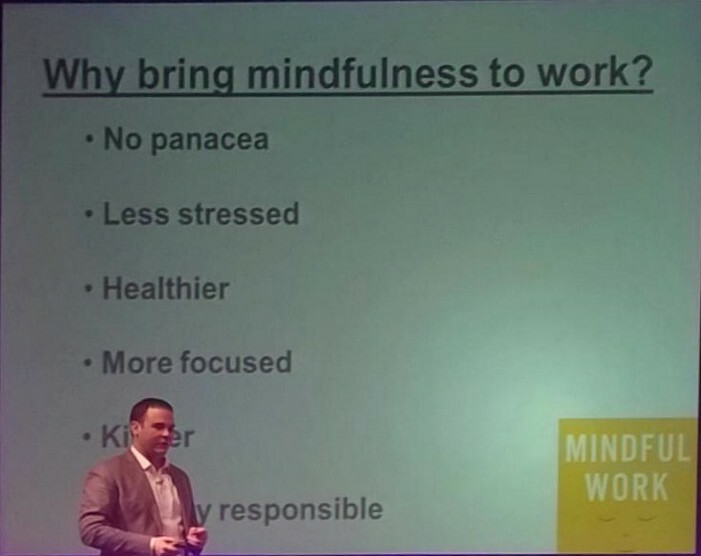 If these are implemented, without the ‘mindfulness’ aspects of meditation, I would expect them to still bring about some of the results – items such as ensuring people take breaks, don’t get made to feel stressed by their managers, given a chance to reflect and pause, etc. The “being right here, right now” element is the aspect I need to look up more about as, if anything, I feel I do that too much and don’t plan ahead enough. This is partly as my to-do lists tend to go out the window due to the work of others and that complexity is the challenge of the modern environment. I also need to look up a suggested easy first step – the Headspace app. I skipped over the final conference session to spend some time in the exhibition and catch up with some old colleagues. Overall, the conference has clearly got me thinking about how I would drive an organization forward (at least how I can push certain viewpoints from my role) and it was a much more pleasant way to attend the Olympia event (with lunch, coffee, places to sit, etc) than a day or two in the exhibition. However, for keeping up-to-date with tools and the technologies themselves I would say a day or more in the exhibition and free seminars are possibly the better route – especially if I had money to spend on new tools and needed to attend demos and training sessions. Perhaps the best of both worlds is attending the Summer Forum exhibition and then the winter conference.